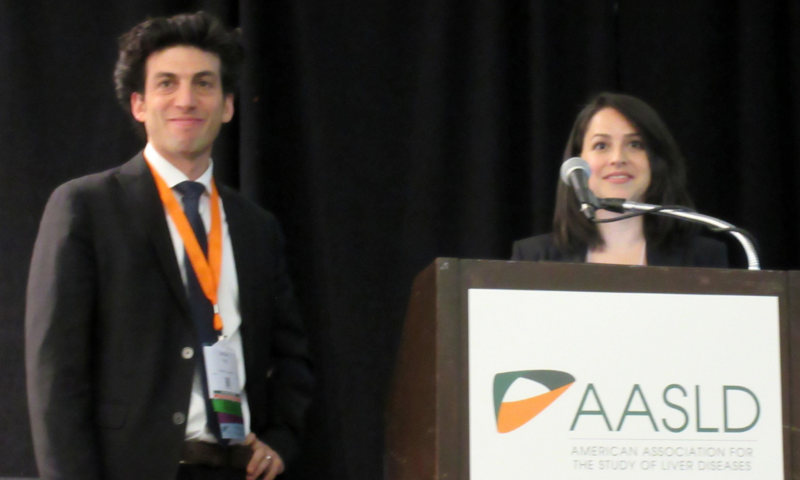 Jordan Feld and Elana Rosenthal at the AASLD Liver Meeting. Photo by Liz Highleyman. Most people who inject drugs completed treatment with sofosbuvir/velpatasvir (Epclusa) and achieved sustained virological response (SVR) in a real-world setting, even if they had interruptions in therapy, according to a presentation at the AASLD Liver Meeting this week in San Francisco. Hepatitis C virus (HCV) is readily transmitted through shared syringes and people who inject drugs have high rates of HCV incidence and prevalence worldwide. Experts and advocates emphasise that widespread treatment of current and former injection drug users will be necessary to meet the World Health Organization goal of eliminating hepatitis C as a public health threat by 2030. However, many people who inject drugs have not been tested for HCV and do not know their status. In addition, this population has traditionally been denied access to treatment because of concerns about poor adherence or reinfection after being cured. Yet clinical trials have shown that people who inject drugs can achieve high cure rates using direct-acting antivirals (DAAs). Dr Elana Rosenthal of the University of Maryland School of Medicine presented results from the ANCHOR study, which evaluated hepatitis C treatment offered at an urban harm reduction centre in Washington, DC. Earlier this year Rosenthal reported that combining HCV treatment with opioid substitution therapy using buprenorphine improved adherence and reduced harms associated with drug injection. At the AASLD meeting, Rosenthal presented findings from an analysis of how imperfect medication adherence and gaps in therapy affect treatment success. The study enrolled 100 participants with chronic HCV infection and opioid use disorder who had injected drugs within the past 3 months. Three-quarters were men, more than 90% were black and the median age was 57 years. About a third had compensated cirrhosis, but those with decompensated liver disease were excluded. About 60% said they injected opioids at least once daily, a third reported receptive sharing of injection equipment (meaning someone else used it first) during the past 3 months and 40% reported hazardous alcohol use. In this analysis, only a third were on opioid substitution therapy for addiction. Rosenthal described the participants as an "incredibly marginalized population." About half were homeless or unstably housed, 92% had a history of incarceration and more than 90% had either no income or only government benefits. All study participants were prescribed 12 weeks of treatment with Epclusa, a one-pill, once-daily pan-genotypic regimen that is effective against all HCV genotypes. Medication was dispensed in bottles containing 28 pills at baseline and at weeks 4 and 8. Rosenthal's team measured HCV viral load at week 4 as an early marker of adherence and asked about interruptions in treatment, the number of pill bottles finished and, for those who finished all three bottles, when the last pill was taken. Adherence was good overall. Attendance at the 4-week follow-up visit was 88%, and at that point 89% had undetectable HCV viral load (< 200 IU/ml). Attendance dipped to 70% at the 12-week visit, but returned to 88% at the final 24-week visit. The overall cure rate was 78% in an intention-to-treat analysis of the 93 participants who completed 12 weeks of post-treatment follow-up. One in 10 experienced virological treatment failure, 9% were lost to follow-up and one person died. In a per-protocol analysis of the 82 individuals who remained in the study, the SVR rate was 88%. Viral load at week 4 was a good predictor of which people would go on to be cured. Among those with undetectable HCV RNA at that point 4, 86% achieved SVR, compared with just 25% of those with detectable viral load. Most participants finished all three bottles of Epclusa, and their SVR rate was 85%. Another seven people took at least two full bottles, with an SVR rate of 71%. However, none of the six participants who finished less than two bottles were cured. Twenty people finished treatment on time in 12 weeks, achieving an SVR rate of 95%. Another 43 people took longer to complete the 12 weeks worth of medication due to gaps in therapy, but they still had a high cure rate of 88%. Thirteen people did not complete treatment, and their SVR rate fell to 38%. "As long as patients completed the prescribed amount, imperfect adherence was not associated with decreased cure rates," Rosenthal said. Thirteen participants reported treatment gaps at some point during the 12-week course of therapy. Nine of these interruptions lasted 10 days or longer, with the longest being 70 and 196 days. Reasons for treatment interruption included medications being lost or stolen, hospitalisation, incarceration and entering inpatient drug treatment. People with no treatment gaps had an SVR rate of 86%, compared with 67% for those with any interruptions. Everyone who had gaps lasting 3 to 10 days, as well as the two people with the longest gaps, were all cured. However, three people with intermediate gaps of 14, 15 and 30 days did not achieve SVR. The likelihood of being cured was not affected by daily injections, unstable housing, hazardous drinking or lack of opioid substitution therapy, Rosenthal said. "PWID [people who inject drugs] have high rates of completion of DAA therapy and achieve high rates of SVR," the researchers concluded. "Imperfect adherence does not seem to impact SVR outcomes, even in patients with interruptions in treatment. Completion of at least 8 weeks of [Epclusa] is important for achieving SVR." "Our data demonstrate that people who inject drugs can achieve SVR at comparable rates to non-drug using populations, even if adherence is imperfect," Rosenthal said. "Therefore, there is no justification for excluding people who inject drugs from being treated. In fact, people who inject drugs should represent a unique high-priority population, because injection drug use remains the primary reason for on-going HCV transmission in the U.S. Therefore, treatment of people who inject drugs will help prevent new cases of HCV." Kattakuzhy K et al (Rosenthal E presenting). High SVR in PWID with HCV despite imperfect medication adherence: data from the ANCHOR study. AASLD Liver Meeting, San Francisco, abstract 0018, 2018.